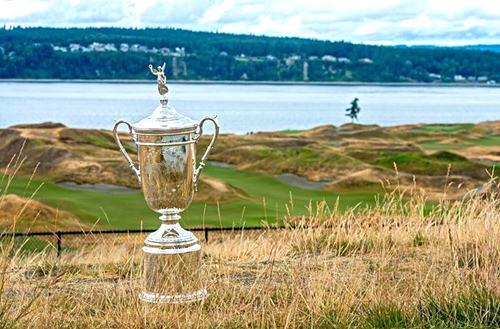 It went down to the final hole at the U.S. Open at Chambers Bay as Jordan Spieth won his first U.S. Open title after Dustin Johnson was not able to sink his last putt to force a Monday playoff. It was a memorable time for many at the University Place course as the years of waiting for the area’s first major golf championship was worth the wait. The drama of the last nine holes was intriguing even for the casual golf fan as the lead seemed to change after each hole as golfers either made incredible shots or unfortunate misses. Despite the constant criticism about the grass and the putting greens, the excitement of the final day of the tournament exceeded expectations. Perhaps someone not fond of the course was Tiger Woods. One of the most popular golfers during the practice rounds, Woods was in trouble from the start of the tournament on Thursday. His rounds saw him scouring the grounds for his ball as his shots were all over the course. In one instance, he slipped and almost fell on his behind while navigating a grassy hill. He even lost his club on the back swing as he tried to dig out his ball from a patch of grass. He was 10 over par for an 80 (which is bad) on Thursday including nine holes where he scored over par. At one point, 15-year-old amateur golfer Cole Hammer was in front of Woods on the leaderboard. On Friday, Woods did a little better scoring 6 over par for a 76, but he did not make the cut of players to make it to play the weekend. In comparison, Jordan Spieth, the eventual winner of the tournament shot a 68 and 67 on Thursday and Friday of the tournament. Tony Finau was in contention on the final day but faded on Sunday. The 25-year-old Finau is the first person of Tongan and American Samoan descent to play on the Professional Golfers Association Tour. The 6’4” Finau was one of the taller golfers at the U.S. Open. In fact, Finau was offered college basketball scholarships but chose to turn professional in golf at the age of 17. In the end, Finau finished 2 over par and tied for 14th place. One of the more popular Asian players on the course was Shigeki Matsuyama. He was followed throughout his golf rounds by Japanese media and fans. Although the course had strict rules against obtaining autographs, Matsuyama obliged his fan base by signing for fans after finishing up practice at the driving range. Matsuyama tied for 18th as he was 3 over par. 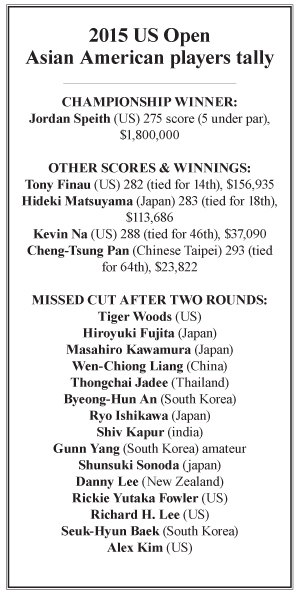 Despite the disappointing showing, Matsuyama is the 14th ranked golfer in the world despite just turning pro in 2013. India’s Anirban Lahiri did not make the cut as he was 7 over par. The 27-year old Lahiri was the only player from India in the U.S. Open field. Although Lahiri primarily plays on the Asian and European Tours, he made the U.S. Open field. Earlier this year, Lahiri was just the third golfer from India to play in The Masters. Notably, UW alum Cheng-Tsung Pan made the cut of players to play the weekend. With his college golf coach as his caddy, Pan was a home state favorite. During the practice round on Tuesday, he wore a purple Husky shirt in honor of his alma mater. According to Wayne Okimoto, durihng te practice rounds, fans watching Pan cheered and applauded him and some shouted “Go Dawgs” in support.